Isagenix Dairy Free Shakes Now in NZ! If you are lactose intolerant, you can now enjoy all the health benefits of Isagenix Shakes without the digestive discomfort thanks to the new Isagenix Dairy Free Shake. These premium shakes are your ideal answer for a convenient meal replacement. All Isagenix dairy-free shakes come in single-serve sachets and in easily transportable boxes of 14, giving you an energy boost at the gym, at work, or anywhere on the run. Isagenix dairy free shakes are made from rice and pea protein, making them ideal for non-dairy, vegetarian, or vegan dietary lifestyles. Packed with 24g of lean protein, 8g of dietary fibre, and 21 vitamins and minerals, these shakes are perfect for shedding kilograms and keeping the weight off. All natural. All delicious. Just add water and ice! We know you want to see results, but not be miserable while dieting. 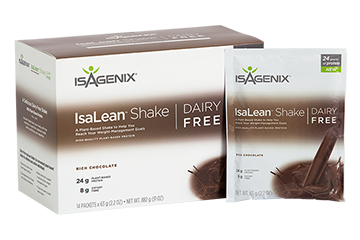 Isagenix dairy free shakes are currently offered in our delicious chocolate flavour, making it ideal for chocoholics who still want to lose weight. Our mission is simple: Nourish your body, improve your health, and give you a high quality meal-replacement alternative. Purchasing a box of 14 sachets is $74NZD on the autoship program, and $96NZD for retail orders. The shakes are only available in sachets, not canisters.